The following resources are helpful in researching and learning about land grants in North Carolina and in general. All links will open in a new window/tab. This is the "go to" book for any type of historical research in North Carolina. The Land Grant Files found on this website are discussed in Chapter 31 by Margaret Hofmann, and other information about land can be found in chapters 2, 7 and 13. Contains information about early Tennessee land grants issued by North Carolina. Information on how to access images on ancestry.com is provided. Access is free for current Tennessee residents. MARS is a searchable database of all the holdings at the State Archives. Although most entries are at a general level, detailed records are available for certain holdings such as land grants and wills. You can use this to look up land grant records for counties not covered on this website. It can be a little tricky, and you can find detailed searching instructions with screen shots on Ginger Smith's blog. Mecklenburg County has digital images of old deeds, many of which are a result of land grants. The searching is a little tricky because you have to use images of index books which are a little quirky, so it is probably a good idea to look at their First Time User and Tutorial pages. Anson County has digital images of old deeds, many of which are a result of land grants. The searching is similar to Mecklenburg, so please check their online help materials. Ginger Smith maintains a list of county Register of Deeds offices that have their historical records online. 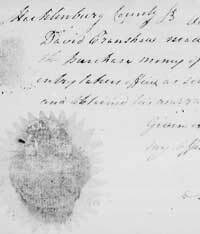 The South Carolina Archives has an online catalog of land grants with document images. The Library of Virginia has an online catalog of land grants with document images. This site contains lists of books published by Ms. Hofmann and other authors about various North Carolina land records, available for purchase. This site contains lists of books published by Dr. Pruitt and other authors about land entries, warrants and grants in North Carolina, as well as some general information about land in NC. Mr. Dunaway has published many books of interest to NC historians/genealogists, many of which include land records. His books often contain high quality images of the original documents.